❝ UEFA began disciplinary proceedings against Celtic last week after a number of fans displayed Palestinian flags during their 5-2 home victory against Israeli club Hapoel Be’er Sheva in a Champions League qualifier. In an attempt to match an impending UEFA fine for displaying the flags, supporters of the Glasgow club have exceeded their initial target of raising £15,000 for Palestinian charities. 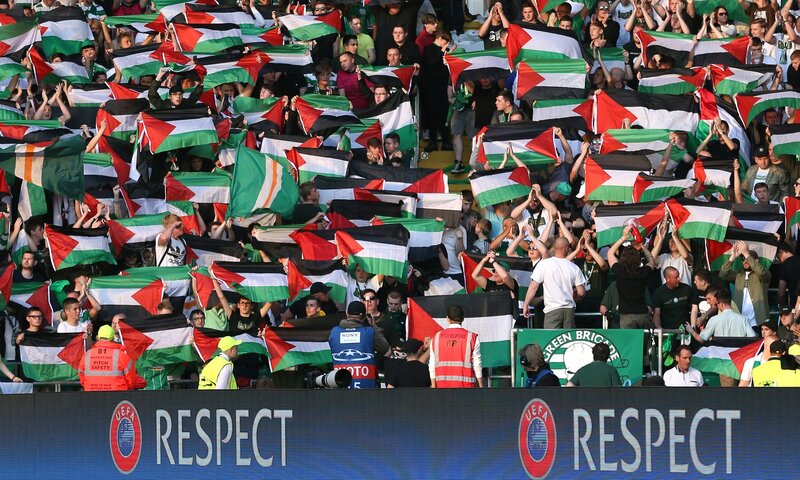 Since UEFA’s threat against the club went viral, supporters have now raised over £140,000 for Palestinian charities. Here’s the link if you wish to donate. ❝ The Green Brigade group of supporters set up an appeal on the gofundme website on Sunday to match the anticipated fine. The fans are raising money for Medical Aid Palestine, which delivers health and medical care to those “worst affected by conflict, occupation and displacement,” and the Lajee Centre, a cultural and sports project for children in Aida refugee camp, in Bethlehem. BTW, the away leg was played in Israel, this week, and though Hapoel won the match, aggregate score gave victory to Celtic. Hapoel is now out of the tournament. In Israel’s “traditional spirit of fair play”, they limited the number of Celtic supporters allowed to attend the match to 250. They were searched by police before entering the stadium and threatened with arrest if they demonstrated support for Palestinians during the match.